One of the best ways to grab attention is to stand out, isn't it? In a sea of cars that dot the Indian roads, there are only a few that manage to draw attention and hold it. Most Audis to my eye have begun to look way too similiar and I can't really recollect a time when I stopped in my tracks to look at one, except for the TT and R8. 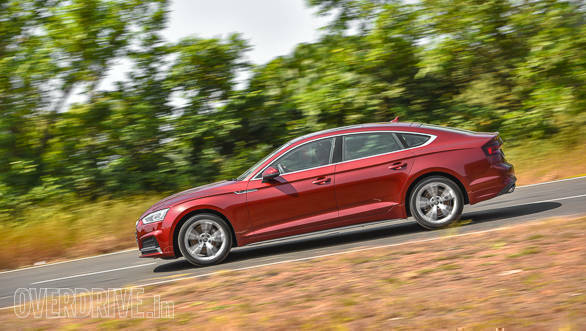 But, when I saw Audi's new A5 Sportback in the flesh for the first time, I couldn't help but stare. If one was not enough, we also got the A5 Cabriolet along for this drive to see if they have the go to match the show. There's no arguing about the fact that both these two cars look absolutely stunning. 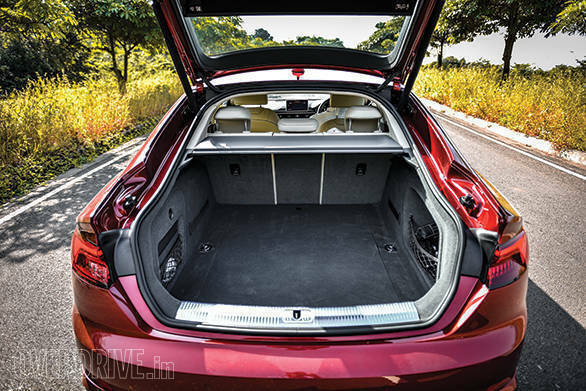 The Audi A5 Sportback, as the name suggests, has a roofline that dives towards the boot, forming a rather stunning profile. The double crease lines on the bonnet, merging into the traditional Audi grille adds character to the face. I also like the shape of the grille and the LED headlamps that add a dose of aggression. The side profile, as mentioned before, is the USP of the car and probably the best angle to view the A5 Sportback, with the rear section being equally good looking. Whichever way you look at it, the A5 Sportback will hold your attention and its stying is truly a welcome departure from the traditional three-box designs. 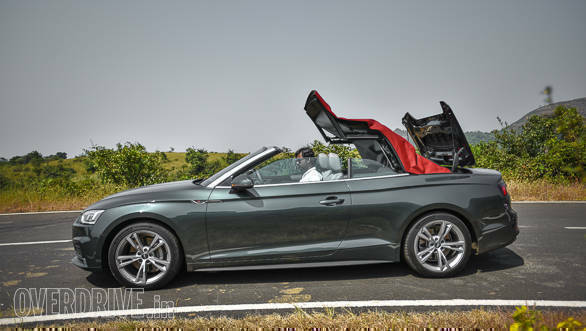 Talking about standing out, the Audi A5 Cabriolet takes the cake here. The front and rear ends as well as most of the side profile is identical to the sedan, save for the foldable fabric roof instead of the hard top. Finished in a contrasting brick red colour, the roof can automatically be stowed away in 18 seconds even when on the move, as long as the speeds are below 50kmph. The charm of a Cabriolet is obviously with the roof folded away, and this is when the A5 Cabriolet looks its best. 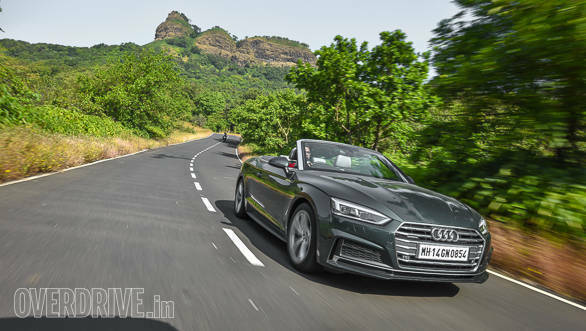 The aluminum finish on the windscreen frame is another neat touch and as far as looks are concerned, the A5 Cabriolet is bound to draw more eyeballs than the A5 Sportback. Together both are a visually treat. 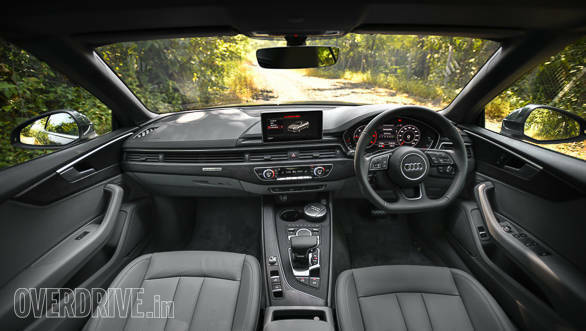 Both the Audi Sportback and the Cabriolet have identical interiors, other than the use of the beige colour in the Sportback. The dull grey of the A5 Cabriolet, on the other hand may not seem very appealing at first, but it has a functional benefit, as it'll be easier to keep clean in our dusty conditions. The electrically adjustable seats are firm and supportive, and given the touring credentials of both cars, quite comfortable too. Space at the back in the Sportback is adequate and the sloping roofline does not compromise headroom as much as you'd expect. 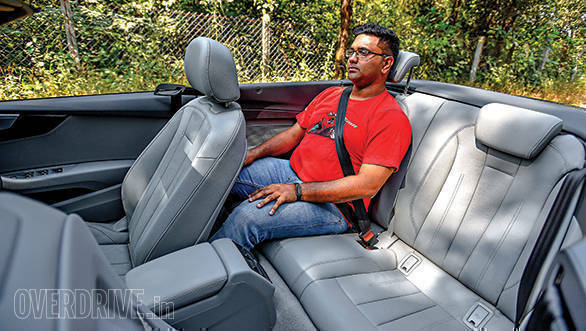 The Cabriolet, though, is a strict four seater and knee room at the rear is just enough to accommodate a 5ft10inch person. With the roof up, headroom at the rear is just about enough. The dashboard layout is simple and sensible and the placement of all switches is intuitive. The Audi A5 has a crisp, 8-inch infotainment system and the display is legible, even in broad daylight. This makes it usable, even when you're driving around with the A5 Cabriolet's roof down on a sunny day. 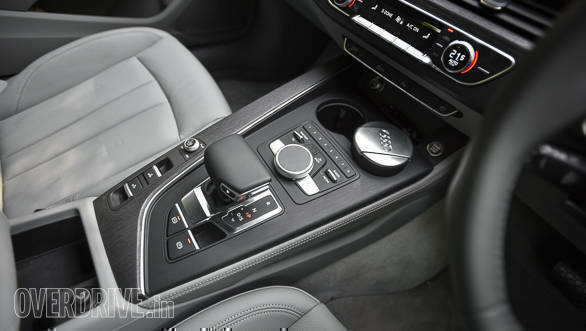 Audi has made clever use of materials around the cabin and the dark non-veneered wood and aluminum switches add to the sense of luxury inside the cabin. Both cars get Audi's virtual cockpit as standard and it's quite a nifty feature, since all the necessary information, including navigation info, is in the driver's line of sight. The flat bottomed steering wheel feels good to hold and I particularly like the tiny kink towards the base that acts as a support for your little finger, when you grip the wheel. This kind of attention to detail makes the overall feeling inside the cabin quite special. That said, some of equipment you see here, like the lovely 755W Bang and Olufsen music system is an optional extra. Both cars here employ the same 2-litre diesel engine that develops 190PS between 3,800rpm-4,200rpm and 400Nm between 1,750rpm-3,000 rpm. Fire up the engine and you hear a typical diesel clatter, especially when you are standing on the outside. 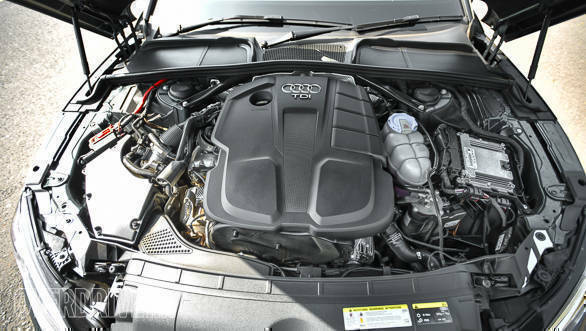 The engine settles into a smooth idle after a few minutes as it warms up and from then on, you begin to appreciate the stellar work that Audi's engineers have done with this engine. This is easily one of the most refined diesel engines we've come across and I love its free revving nature, which is akin to a petrol motor. 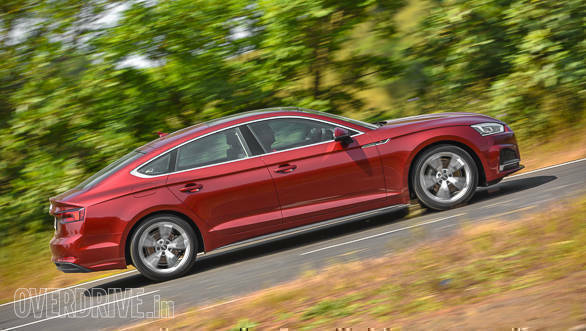 The engine is mated to Audi's 7-speed DSG gearbox that does a brilliant job of laying all the power down. Audi's Drive Select modes allow you to alter the engine mapping and steering response. Comfort mode is the best option for our busy roads. The throttle response is gentle in this mode and the engine runs at the most fuel efficient rpm. The gearbox also up shifts quickly and you barely hear the engine inside the cabin of the Sportback. The sound insulation inside the Cabriolet is also surprisingly good, just a notch below the Sportback's. Slotting the gearstick into Sport and shifting to Dynamic mode alters the car's character in an instant. The engine feels a lot more eager and throttle inputs sharpen as well. If you are in the mood for some fun, this is the mode I'd recommend, especially for fast highway runs. 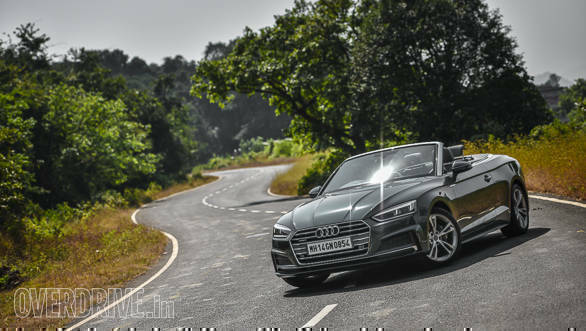 In our tests the A5 Sportback dispatched the 0-100kmph dash in 7.7s while the additional weight of the Cabriolet, thanks to the extra structural bracing, meant it could cross the ton mark in 8.4s only. That said, these are pretty impressive figures, when you consider the fact that both cars are quite large and heavy. The A5 Sportback and Cabriolet have a similar suspension setup. Firm, yet pliant, the A5 rides pretty well over our broken and uneven surfaces. Even the odd pothole does little to disturb the car's composure. 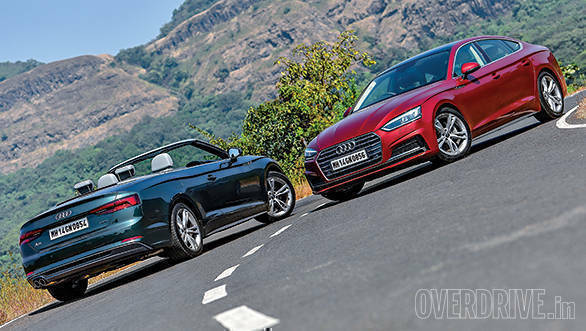 Both cars have multi-link suspension set ups, but the difference in handing is made apparent, not only because of their body styles but also because of the inclusion of Audi's Quattro system in the A5 Cabriolet. Chuck the A5 Sportback into a bend and front end turns in eagerly. There is a very slight hint of body roll when you do that and a little more aggressive pushing will have the car understeer. It, however, is predictable and actually a lot of fun once you get used to the driving dynamics. The A5 Cabriolet's party piece is the Quattro all-wheel-drive system that ensures endless grip around corners making it feel like the A5 Cabriolet is running on rails. 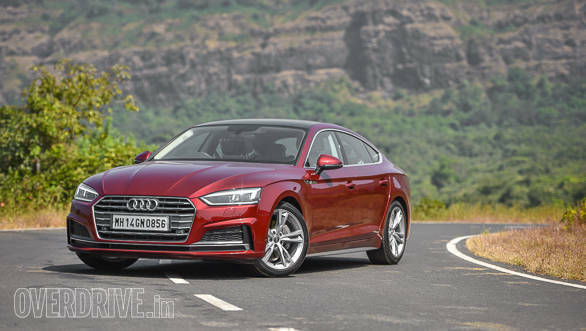 In fact the handling is so confidence inspiring that you wish the Cabriolet had the Audi S5's mad petrol motor to further complement its handling prowess. What makes driving the cars even more enjoyable is the steering. This is possibly one of the best steering systems I've come across in an Audi. The steering wheel weighs up beautifully as speeds increase and there's a generous amount of feedback. Braking performance is another highlight of the A5 and I absolutely love the sharp and confident braking on both cars. 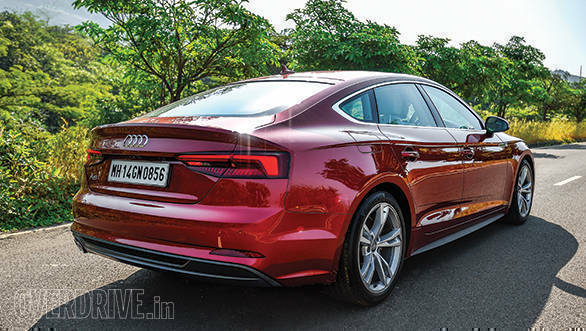 The A5 Sportback came to a dead halt from 100 kmph in 2.9 seconds covering 41.2m. 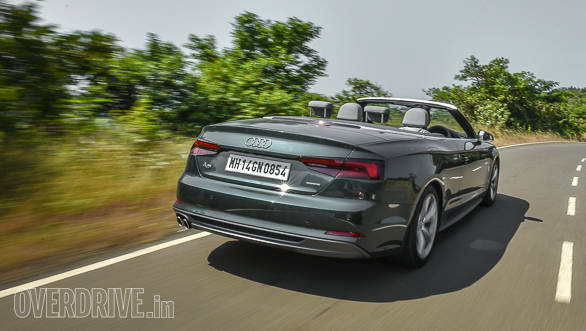 The heavier, A5 Cabriolet took 3.2s to come to a stop, covering 43.8m in the process. The Audi A5 Sportback is clearly for those who want something that looks distinct without having to compromise on space, features or practicality. If you are among those who prefer to drive rather than be chauffeured around, the A5 Sportback makes for an interesting proposition. 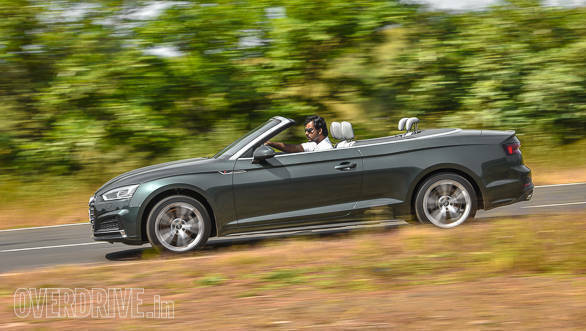 The Audi A5 Cabriolet, on the other hand, is purely a lifestyle defining choice. Barring the spring or winter seasons, there won't be any other time when you'll be driving with the roof down, which is why you'd buy a convertible in the first place.